The old line... got a Harley for my wife... great trade. Its a bike, get over the HD thing. I have traveled across the USA many times, 50,000.00miles and the only thing I have done is wrap your camera in a good old soft towel and use a lot of rubber bands. You should not have any problems. Ive had more flat tires than any broken cameras. And My latest Bike is a Yamaha star Eluder GT, and it already has 8000, and have not lost a camera yet. I wrapped my D5300 and lens in bubble wrap and put it in my T-bag. Rode my Dyna Low Rider from North Carolina to Rhode Island and back. No issues still works like new. I wrap my camera gear in bubble wrap and put it in one of the drawers of the roll-a-way tool chest that I pull behind my Harley. I like to be prepared for the unknown, but also for the known. I sold my Road Glide (same frame and engine) and went to a Goldwing last year. The vibration is truly worth considering. I think if it is only a trip or two I would get a point and shoot camera for those trips rather than gamble on my DSLR. I've been riding a Harley for years with a camera in the side bag or tour pack and have not had a problem yet. Typically when touring I wrap it in whatever clothing is handy but I have also used an SLR soft pouch such as that sold by Op/Tech when space is less of a problem such as when riding locally. I agree with the comment about security by the way; I wouldn't leave it in an unsecured bag strapped to a rack for example. Ride safe. I've riden many makes and models over the decades, yes the Harley is a bit of a shaker, the Wing models have always been quite smooth. On my last couple of sportbikes (996 & GSX-R, etc.) I used a tankbag, less vibration than anywhere else on the bike and a backpack (either wore it, or strapped to the back of the seat). You want the camera bag somewhere that is not on a mount that exagerates the shake, strapped firmly to the rear of the seat, or up behind the windsheild (if yours has one), and again, tankbag is a great choice (and a good quality one won't harm the tank/paint in any way. Backpacks are good, but they do become tiresome after wearing for some time on the road. Foam or towel wrap is great. Another option is a bridge or pocket camera (with as many great features as you can afford) or rent a camera so yours stays safe. I often carried a sacraficial film/digital camera when I rode, trhat way if anything happened it wasn't as big a loss. If you want to carry several lenses and such, I'd say tankbag. Another option might be a videocam with a bar mount and quick takeoff so you can film while riding and remove for walkabout. Whatever you do, ride safe, eyes wide open, two fingers brake/clutch, don't count on loud pipes to keep people from pulling out in front of you, make yourself visible, and have a bunch of fun!!!! Wrap it in bubble wrap. Can’t be any worse than how the delivery services handle packages. Good riding. 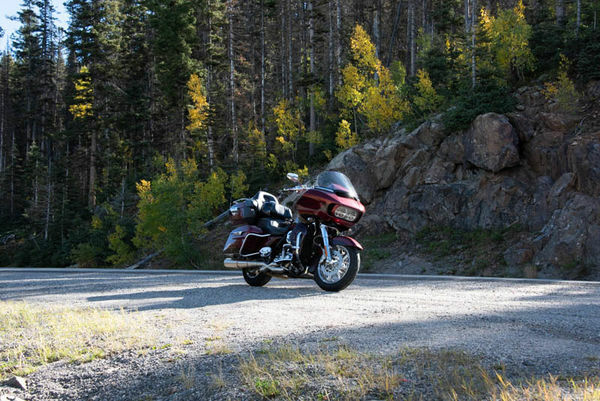 I too rode a Road King and would travel with my camera. Since space is limited, I packed my Nikon in a saddle bag wrapped in a shirt and then placed in a small camera case - packed near the top of my saddle bag for easy access. I never had a problem. All suggestions short of trading the RK for a BMW 1200 series, a GW, or Indian is an experiment. Isolation of a smaller bridge or compact camera would my choice if the bike tradein doesn’t work for you. Until a few years ago, I owned a Victory touring bike that had minimal vibration for a v-twin. Until I abandoned carrying a DSLR, I surrounded the camera padding with shock absorbing foam and put it in the trunk. I still crossed my fingers every time I opened the trunk. Unfortunately, few cameras are subject to Mil-Spec 16400 S & V testing. Yep, a RK can really shake especially at idle. Not knowing what camera you have maybe consider a quality P&S (Bridge) camera and just wrap it in Styrofoam in the luggage rack case, most of them are pretty hardy. Just last month I got a toolbox and had a foam store put custom cut padding in it to hold my Pentax 500mm lens. For my protection purpose, the padding they insisted on using open cell sponge and they had just about every kind of stuff on the planet. I would think a small Pelican Case would do the trick .........Invicta uses them for their Watch Cases and they're also water tight as well and air-cargo rated and should lessen the shock when you put your cycle into a pot hole........heaven forbid ! Contact them and let us know your findings. 1. If you have a trunk, buy a camera backpack and put your gear in it...i have a LowePro BP250AW that fits nicely in my trunk. Never had an issue. 2, if the runk is too full, I use the towel method...wrap the camera and lens in separate towels and put them on top of something soft. Keep the shiny side up and enjoy the ride. Its safe just as long as you don't fall or crash into anything. Then its bye bye camera and probably you too.